Over the last year I developed a love affair for Insect macro photography. 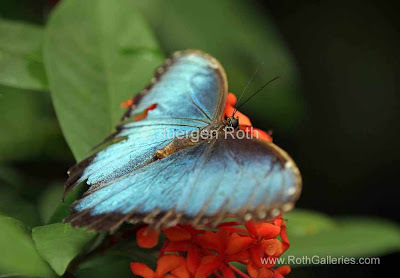 Insects like butterflies, dragonflies, grasshoppers, flies or other little creatures have become a prime subject through my portfolio. 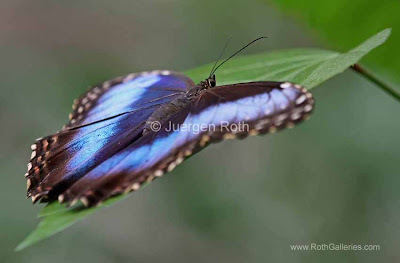 In particular I am amazed by the many colors and species of butterflies. 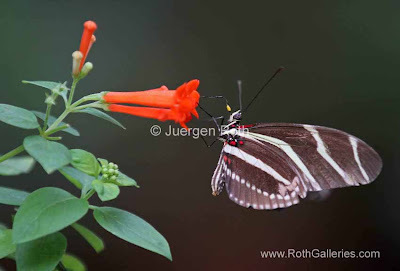 Photographing butterflies accelerated last August with a visit to Butterfly World near Delray Beach, Florida. When returning home to Boston from this beautiful butterfly paradise I was determined to find a suitable location here in New England. One location I frequently visited early fall was the Mass Audubon Broad Meadow Brook Wildlife Sanctuary in Worcester, MA. The sanctuary has a little butterfly garden that many insects are calling their home and made for great and convenient macro photography in the field. A quick google search late last fall unveiled Magic Wings in South Deerfield, Massachusetts. 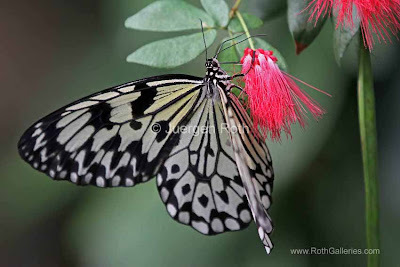 It is a smaller indoor butterfly garden than Butterfly World in Florida but it sure provides me with sufficient butterflies to photograph on any given day here in New England. In fact it is an amazing and incredible experience and encounter with Mother Nature; what a fantastic place to escape to for a full morning or day and get lost with a camera and gear. 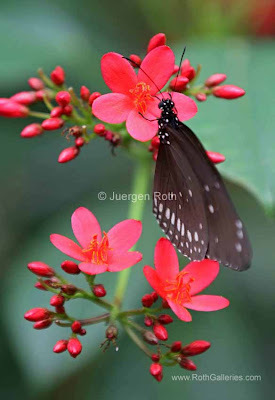 Seeing butterflies of every type and color fluttering around the beautiful garden is simply a joy. 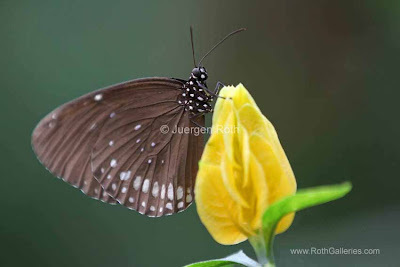 Each visit I spent about 3 hours pursuing insect Macro Photography. 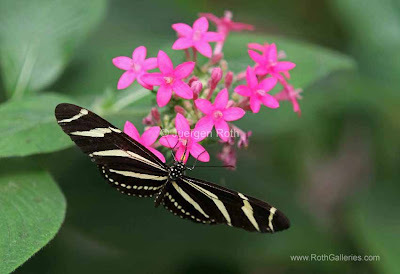 At first I equipped my Camera with a Canon 100mm macro photo lens but ran into limitations of composing frame filling images since the butterflies took off when I got too close crossing the line of their comfort zone. The Canon 70-200mm lens provided a handier approach and adding a Canon 1.4x tele converter made it a much more pleasant photo experience at up to 420 mm focal length. In order to compensate for the longer lens and slower shutter speeds adjusting the ISO setting to 200, 400 or 800 is a must. A medium (f/stop, 11 and less) to large aperture setting (small f/stop, 5.6 and less) not only supported my quest for that faster shutter speed but also created the best Depth of Field results. A shallow depth of field is mostly desired when photographing wildlife, birds or in our case bugs. 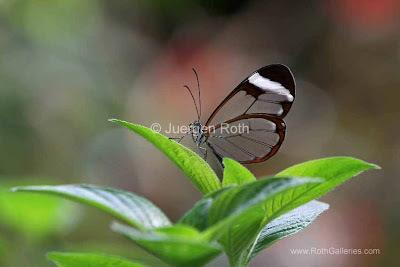 It supports beautiful isolation of the main macro photography subject against a blurred background. Unfortunately Magic World does not allow the use of tripods or monopods during normal operational hours from 9 to 5 am. During those hours hand-holding the camera gear is one option while I always try to find a replacement tripod like the arm rest of a bench, tree branches or anything that might support a quieter hand and sturdier camera for Sharper Photography results and better image quality. Note that a group of 4 can enter the garden from 7 to 9 a.m. before official hours of operation. The cost is $60 for all 4, hence 15 bucks each is quite reasonable compared to the normal entry fee of $14. At that time one is also allowed to bring in a tripod or monopod. 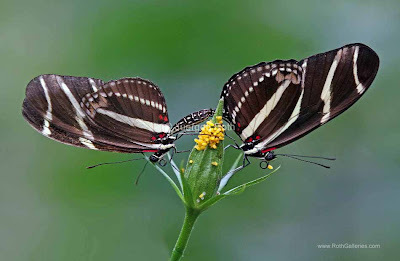 So, when you are in the area and plan a 2 hour butterfly macro photo shoot in the early morning hours at Magic Wings, please Give Me A Shout to split the cost … if I am around and otherwise not busy I will join you and we can split the cost and hopefully bank some great bug pictures!